The establishment of the Rapid Rail Sdn Bhd was done with the sole intention of bringing in all rail operators along the, Sri Petaling Line, KL Monorail Line, Kelana Jaya Line and Ampang Line under one administrative umbrella based in the city of Kuala Lumpur in Malaysia. This network comprises two Metro lines, which in strict British English would be referred to as Light Transit Systems, while the third important component in the network is made up by the Monorail service. 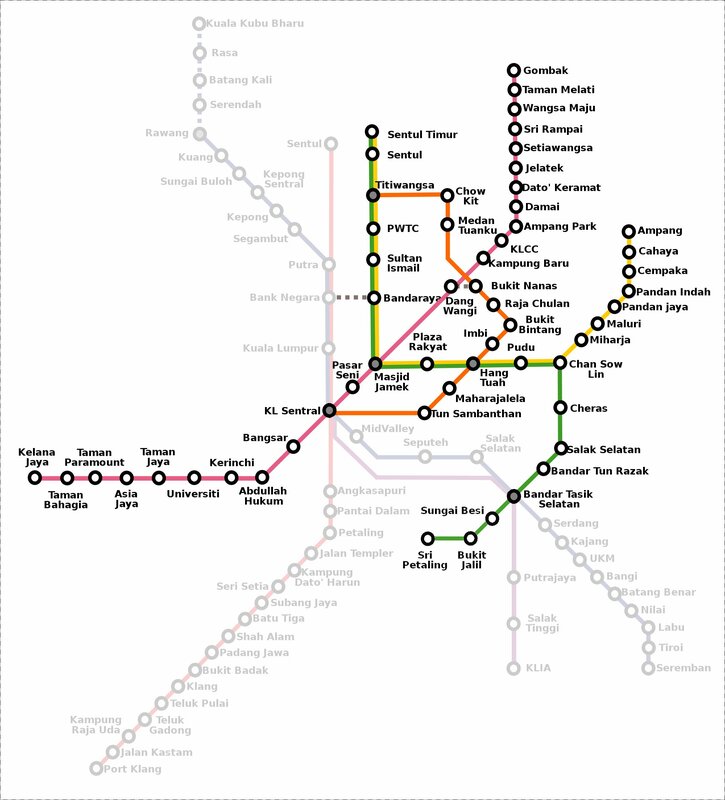 Covering a total length of over 100 kilometers with as many as 81 stations along the way, this three-pronged transportation network forms an integral part in the public transportation system of Kuala Lumpur. As of 2015, Rapid rail recorded an annual ridership of more than 170 million. The Ampang Line is made up of two different lines: one that travels towards the east and another that is aligned in a north-south direction. The Sri Petaling-Chan Sow Lin route offers connection to the southern parts of the city while the Ampang-Chan Sow Lin service caters to the needs of commuters in the Pudu Town and Ampang suburbs of Selangor. Both these places are located along the northeast stretch of Klang Valley. The lines converge at the Chan Sow Lin station before heading north as a merged service to terminate at the Sentul Timur LRT Station. The Kelana Jaya Line is a single service connecting the northeastern region of Gombak to Petaling Jaya in the west. It passes through the city center of Kuala Lumpur and also numerous high density residential areas along the northern limits of the city. There are over eight hundred individual bridges along the route with the longest one spanning a length of sixty eight meters. The KL Monorail has 11 stations and runs from KL Sentral till Titiwangsa. The Masjid Jamek LRT Station serves as the point of intersection for the Kelana Jaya and Ampang Lines. It is expected that the Rapid Rail network in Kuala Lumpur will be extended further to offer better access to the citizens. MRT Sungai Buloh-Kajang Line would run between Sungai Buloh and Kajang railway station and is currently under construction. Map of Rapid Rail showing its lines and stations. Click on the map to enlarge it or Download Rapid Rail map in PDF. The trains begin operations at 06:00 am in the morning and run for sometime after midnight. The frequency of the trains differ according to the day and time of the day as well. On weekdays, trains have a minimum headway of 3 minutes and a maximum of 14 minutes. Saturdays too, have more or less similar timings. The only difference is that the time interval between the trains, at the lowest is 4 minutes. On Sundays and other public holidays, the trains are of a lesser frequency. The minimum time interval between two trains being 8 minutes and the maximum being 15 minutes. The fares of Ampang & Kelana Jaya LRT and Monorail Lines of Rapid Rail depends on the distance to be traveled. The minimum fare is RM 0.70 and the maximum fare is RM 2.80. Touch ‘n Go is a stored value card that can be bought for a RM 10 deposit. You can also buy Rapidpass which is the monthly pass for unlimited travel and costs RM 100 for LRT . Students can buy Rapidpass Pelajar and avail 50% discount. Most of the stations have parking facilities. Therefore, allowing its passengers to benefit from park and ride facilities as well.